Arduino boards are nifty microcontrollers appropriate for a smattering of uses. Beginners may start with blinking an LED, while more advanced users can use Arduino boards for cosplay, plant watering systems, and more. The Arduino MKR MEM Shield is a fantastic Arduino accessory. It provides functionality for MKR boards to read and write to microSD cards with the SD library. Plus, the ARduino MKR MEM Shield features 2MB of serial flash memory, This may be used for over-the-air (OTA) updates. The Arduino MKR MEM Shield lets you easily add microSD storage and flash memory to an MKR board. Additional storage and memory is crucial for data storage which proves instrumental for analysis. It’s the perfect companion for Internet of Things (IoT) applications which rely on data capture. Onboard, you’ll find an input voltage of 3.3V, an SPI interface, 10 mA power consumption, and Flash W25Q16JV. Both the flash memory and microSD card are managed on the same SPI bus. Therefore, you can select these via the correct CS pin. There’s further expansion possible since the MKR MEM Shield delivers a additional circuitry. Tons of Arduino boards and kits exist. Since microcontrollers like the Arduino are used primarily for IoT applications and embedded devices, built-in storage and memory is pretty sparse. But add-ons such as the Arduino MKR MEM Shield address this issue, and allow for several gigabytes of data capture for later analysis. In Feb. 2019, Arduino IoT Cloud platform debuted. This intuitive platform aims to advance the democratisation of Internet of Things development by allowing users to manage and develop IoT apps with ease. It’s an end-to-end solution which boasts firmware, hardware, cloud services, and more. 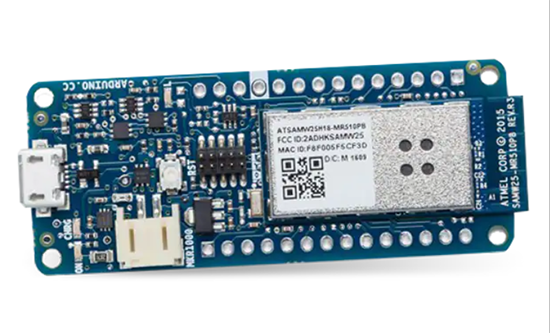 Arduin CTO and co-founder Massimo Banzi stated, “Arduino now offers a complete platform with the MKR family, providing a streamlined way to create local IoT nodes and edge devices.” The MKR MEM Shield belongs to that family along with the Arduino MKR WiFi 1010, Arduino MKR Connector Carrier, MKR Vidor 4000, and more. The MKR family differs from Arduino UNO boards a bit. While the UNO is small, the MKR series is even more compact since it’s aimed at mostly IoT applications. It’s better suited wo wireless connectivity and IoT solutions. The UNO is a better board for beginners and clocks in a bit cheaper, with a massive array of accessories. 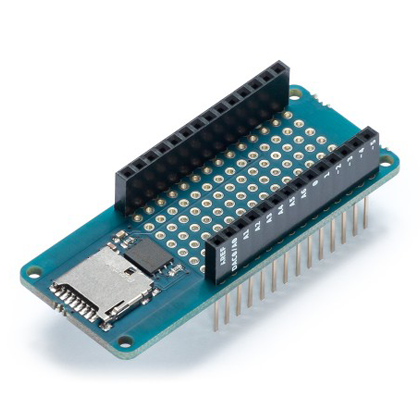 Ultimately the Arduino MKR MEM Shield is a fantastic accessory for the MKR Arduino family with its additional memory and connectivity options.